We speculated above based on an observed association between jaw form and function that if primitive primates were small, had unfused symphyses, and ate insects and fruits, then they probably chewed more like these strepsirrhines and treeshrews than living anthropoids. The earliest adapids, such as Donrussellia, and the earliest omomyids, such as Teilhardina, appear to have been small, fruit and insect eating animals with unfused symphyses (e.g., Covert, 1986; Covert and Williams, 1994; Rose et al., 1994; Strait, 2001). Thus, we hypothesize that the earliest euprimates fit the morphological and behavioral pattern found in the masticatory apparatus of treeshrews and galagos. Our in vivo data on jaw-muscle activity during chewing support the hypothesis that the origin of primates did not involve major adaptive changes in the masticatory apparatus. Indirectly, this result supports the arguments that the origin of primates involved evolutionary changes in the locomotor skeleton (Washburn, 1950) or that it did not involve major adaptive changes in primate form (Cain, 1954; Davis, 1955; Simpson, 1955, 1961; Straus, 1949; Zuckerman, 1933). In other words, we presently see little evidence for a major shift in chewing behavior between treeshrews and the two strepsir-rhine taxa. We base this conclusion on the observation that Belanger's treeshrews are more similar to greater galagos and ring-tailed lemurs than anthropoids in their jaw-muscle activity patterns during chewing. Additionally, treeshrew jaw form appears more like that of strepsirrhines with unfused symphyses than anthropoids (Figure 5). Conversely, our results do not clearly support Szalay's (1968, 1969, 1972, 1973) hypothesis that the origin of primates marked an adaptive shift toward increased feeding on fruits and plants. If we had observed a systematic difference in jaw-muscle activity patterns between treeshrews and primates, then this hypothesis would have been strongly supported. The similarity of both jaw-muscle W/B ratios and peak firing times in treeshrews and the two strep-sirrhines suggests that the origin of primates (or at least strepsirrhines) did not involve significant changes in jaw-muscle activity patterns. As stated earlier, the comparison of jaw-muscle activity patterns does not offer a direct test of Szalay's hypothesis because variation in diets is not directly linked to variation in jaw-muscle EMGs. Thus, we are not rejecting Szalay's hypothesis, but rather suggesting that if an adaptive shift toward increased consumption of plant foods occurred at the origin of primates, then this dietary change likely took place without major changes in jaw-muscle activity patterns during chewing. Because our results cannot directly address potential changes in jaw form at the origin of primates, Szalay's hypothesis deserves further testing by comparing jaw morphology in primates and closely related nonprimates. The two most recent adaptive explanations of primate origins, the visual predation hypothesis (Cartmill, 1972, 1974) and the angiosperm coevolution hypothesis (Sussman, 1991), both involve feeding adaptations, but deal more with acquiring rather than chewing foods. The visual predation hypothesis focuses on spying and catching quick, agile insects on slender branches, while the angiosperm coevolution hypotheses concentrate on early primates' ability to feed on the rich repository of plant materials in the terminal branches of trees. Neither hypothesis stresses dietary shifts in the origin of primates, but rather each emphasizes either insects or plants over the other. Our results suggest that if these predicted changes in food acquisition occurred in the earliest primates (e.g., Cartmill, 1972, 1974; Sussman, 1991), then they did so without significant changes in chewing behavior. Furthermore, our results are in agreement with the scenario provided by Rasmussen (1990) where early primates fed on both plants and insects in the terminal branches. 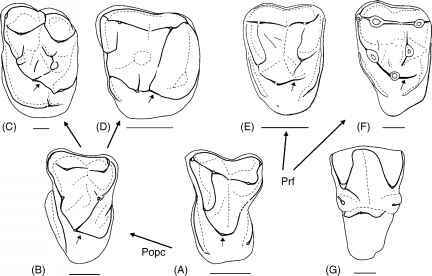 The differences in jaw-muscle activity patterns and jaw form between living anthropoids as compared to treeshrews and strepsirrhines suggest that the origin of crown anthropoids is associated with significant changes in chewing behavior and jaw morphology. Thus, a major evolutionary change in chewing appears to have occurred along the lineage leading to living anthropoids rather than during the origin of primates. We are not claiming that specific strepsirrhine clades, such as the subfossil lemurs or indriids, did not undergo significant changes in chewing behaviors during their evolution. Rather it appears that among the two primate suborders, the origin of living anthropoids is more likely to have involved major restructuring of the masticatory apparatus (e.g., Hylander, 1979b; Ravosa, 1991; Ravosa et al., 2000; Rosenberger, 1986). Future work will determine whether these changes occurred in parallel among platyrrhines and catarrhines and to what extent this restructuring of the masticatory apparatus is related to functional and morphological changes in other organ systems housed in the skull.